I make a big deal about Neomodern not being a gallery, meaning we generally aren't in the business of selling fine art. Still, we maintain something of a museum on the walls every day, showing iconic images that we think will inspire your picture taking. We intermix these with wonderful work from our customers—you—which we think demonstrates some amazing (and unselfconscious) art. Today we have a group of Cartier-Bresson up, as well as Andre Kertesz, Robert Doisneau and Elliott Erwitt, all funny French street photographers. We have also just featured the work of German-American John Gutmann, a number of his prints that will remain up through Thanksgiving. 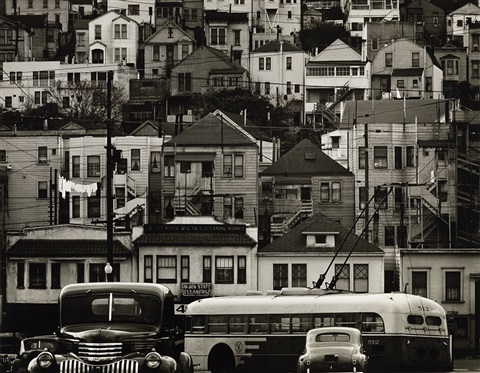 Following Gutmann, our Winter "show" will feature interesting prints of San Francisco, and particularly the work of artist Max Yavno who shot in SF and LA in the mid-20th century. Looking ahead, our featured photographer in the spring will be Marion Post Wolcott, a depression-era artist who documented poverty for the government; interestingly composed images, full of heart and humor. Her work was rediscovered in the 1980s and now can be found in the Smithsonian and the Metropolitan Museum of Art. We'll add a few other fantastic women of photography throughout the Spring, including Helen Levitt and Alma Lavenson.